EAT Remedy 2 KA 12-1-17 Kristin Anderson A spread of Remedy's offereings including: Bi Bimp Bap, Spicy Tuna Bowl, Pretzel Charcuterie, Bison Flatbread Pizza, Truffled Goat Cheese Flatbread Pizza, V cocktail, and Old Fashioned cocktail. What: The Remedy, a hip bar and lounge with upscale bites. Where: Four Seasons Resort and Residences Vail, One Vail Road, Vail. Cost: Appetizers $8-$18; small plates, entrees $13-$48. Signature dish: Elk Red Chili. More information: Call 970-477-8600 or visit www.FOURSEASONS.COM/VAIL/DINING/lounges/the_remedy_bar. With its floor-to-ceiling windows and an always-fun vibe, The Remedy Bar is the place to warm up during the lunch hour or linger on to watch alpenglow bathe the hills. 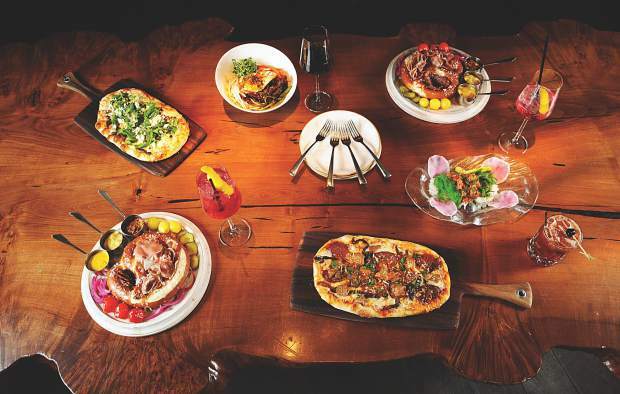 At this hip lounge and dining area within the Four Seasons Resort and Residences Vail, you can snack, drink and dine to the sounds of live music three nights a week or unwind while watching snowflakes fall beyond the outdoor patio’s cozy fire pit. And all who gather here love choosing from a playful menu that embraces the theme of food and drink as remedies for whatever the day may hold. The Remedy Bar is well known for its innovative beverage program, which makes it a not-to-miss destination for fresh food and drink pairings. “We create all of our own juices and shrubs in house for a refreshing taste in our fruit-based drinks,” says bar manager Aaron Ritrovato. A shrub in this context is a fruit-based cocktail ingredient that creates a pleasantly balanced taste rather than a sugary or syrupy sweetness. Try out this smooth-sipping addition in the colorful V, a vodka cocktail that includes the housemade blueberry and rosemary shrub, St-Germain, citrus, and the bubbly goodness of Veuve. While the V is just one example of The Remedy Bar’s creative originals, new takes on classic cocktails are also done well here. Some unorthodox muddling and shaking—along with a Remedy select bourbon—makes the Remedy Old Fashioned an easy-drinking version that pales others in comparison. Whether you’re snacking or dining at The Remedy Bar, options range from a steak frites entrée to the Rocky Mountain Elk Red Chili, complete with three types of beans, Hatch red chiles, sour cream, Beehive cheddar and jalapeño cornbread. Settle in with a gourmet pizza or something to share, such as Spinach and Artichoke Dip, which includes jumbo lump crab and oven-dried tomatoes in a creamy delight to be piled atop naan bread. The Ten Alarm Chili Bison Burger is also a hit, with bacon, pepper jack cheese, chili compote, avocado, chili relleno and fries. With the addition of a new Game Night on Wednesday nights this winter, you’ll have another reason to stop by The Remedy Bar with family and friends for an evening of fun board games and gamey food selections including elk sliders, venison chili, bison pepperoni pizza and elk corn dogs, among others. Sports enthusiasts, especially, will appreciate The Remedy Bar lounge’s wall-sized television and multiple screens, which can show up to 10 games simultaneously for the ultimate sports-viewing experience. The fun continues into the weekend with a make-your-own Bloody Mary bar that features an extraordinary mix of ingredients and toppings. With a full schedule of other activities and entertainment planned for the winter season, you can count on the atmosphere at The Remedy Bar to be fresh, interesting, and—above all—fun.